15.0 Lbs (WxLxH) 14.9" x 6.4" x 18.2"
This is my first widescreen. I've thought about tweaking settings because I'm a tweaker at heart, but why mess with something that seems perfectly fine? Longevity is a factor to be determined by use. Takes up less space, easy to look at. Sharp clear picture. 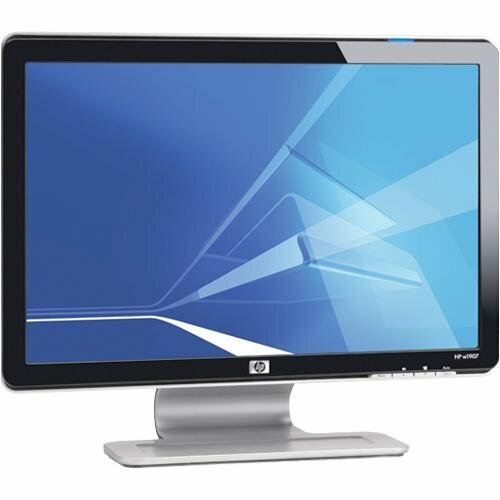 I recently purchased this HP Monitor and am really very happy with it as with all HP's products. The color is just fantastic, so realistic! In my opinion its the perfect size. Not to large Not to wide. Setup was easy except for the base. The instructions showed where it hooked on and said how to put it on. This reminds me of a recipe for rabbit that begins, "First, catch a rabbit." I was worried about breaking a part so I didn't want to really force it. It took quite a bit of force to get things together and some experimentation to figure out a technique. I'll probably leave the base on whenever I move. Otherwise, setup was a piece of cake. Hook up the cables and run the computer. My power supply has an outlet for the monitor and the 1907 goes on and off with the computer. Picture quality seems great! I have an ATI Radeon X1600 PCI-X graphics card running under Vista 64 Home Premium. I had to use the install CD from the monitor before I could set the resolution to the native 1440x900 pixels. There is a bit of stretching of icons and graphics in programs not designed for the widescreen. I almost didn't notice this. The only problem I've had is (was) an occasional blink of the screen. The screen goes black for a second or two then is back to normal. The program is unaffected. This would happen once in a few hours of time on the computer. It was more common under Win 2k but has happened once or twice with Vista. I'm connected with a DVI cable. The screen goes dark after one second of displaying the screen content. If I cycle power, then the screen turns on for one second, then goes dark. This is a piece of junk. The back light is going kaput on the first day of operation! My old 17" LCD monitor kicked the bucket recently so I had to replace it with a new one on the spur of the moment. Intially, this wasn't my first choice but a Samsung model which was out of stock. 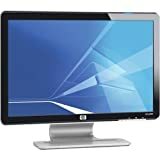 Having had problems with HP computers in the past, I was wary of how this monitor would perform.